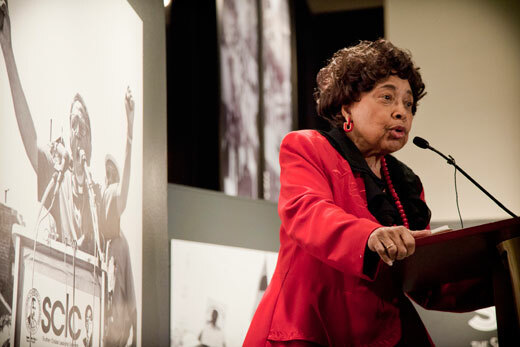 Dorothy Cotton, former education director for the SCLC, speaks at the first-ever exhibit of the SCLC archive at Emory. Emory Photo/Video. The past and present of the American civil rights movement came together Feb. 22 at Emory University's Manuscript, Archives, and Rare Book Library (MARBL), where more than 200 people celebrated the opening of the first-ever exhibition showcasing the archive of the Southern Christian Leadership Conference (SCLC). Several past and present SCLC leaders took the podium to praise the exhibition mounted by MARBL, including Congressman John Lewis, who said "it is fitting and proper for these papers, these records, to be located here in the heart of the American South, right here in the city of Atlanta, right here at Emory University." Lewis said his prayer is that young and old, researchers and students, will come to the archives and that they will "use it as an inspiration to take action." President Jim Wagner, in his introduction of Lewis, said he is enormously proud that MARBL has collected so much history. "It's not just African American history, it's everyone's history, black and white, Asian and Latino," he said, noting that MARBL doesn't just collect history to preserve it, "but to make it available to all." The SCLC exhibition raises the question of how far we have come, said Wagner, and how much further we need to go. "I pledge myself to working toward that just society that we all seek," he said. "I have a ways to go, Emory has a ways to go, our city has a ways to go, our state and our nation." 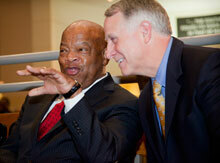 Congressman John Lewis and Emory President Jim Wagner were among the speakers at the opening celebration of the SCLC archive exhibition Feb. 22. Emory Photo/Video. The exhibition, "The Struggle Continues: The Southern Christian Leadership Conference's Fight for Social Change," features some 200 documents, photographs, flyers, audio clips, and other memorabilia from the sizable archive, which Emory acquired in 2007. Curators have spent the years since organizing more than 1,000 boxes of materials for research and educational use. The archive officially opened last May, and already is being accessed for research, but the exhibition opening served as a public introduction of this historic resource. Adding to the spirit embodied by the gathering, about 40 silent protesters—the majority students—held up signs protesting recent events at the university, including reallocation of resources in Emory College and Wagner's reference to the Constitution's "3/5th compromise" in an Emory Magazine column. Curator Carol Anderson, associate professor of African American Studies at Emory, told the assembled that the exhibition touches on almost every facet of the struggle for equality—poverty, unemployment, gun violence, voting rights and efforts in other parts of the world. "This history of SCLC did not end in 1968," she said, but entered into "a new struggle for human dignity." Dorothy Cotton, education director for SCLC from 1960-1968, reiterated the enthusiasm of a lecture she gave on campus earlier in the day by singing parts of "I've Been in the Storm So Long" and then "I'm Gonna Do What the Spirit Says Do," and getting the crowd to sing along. "We sang all the time," she said. "But we didn't just march—we were studying, learning." "I want you to pay attention to putting people in categories," Cotton added. "Because once you get people in a category, you do weird things to them." Other speakers included Charles Steele, national CEO of SCLC, who described being invited to meet with former Emory Provost Earl Lewis and Wagner soon after his arrival in Atlanta in 2005. The Rev. Dr. Bernard Lafayette Jr., national board chair of SCLC and Distinguished-Scholar-in Residence at Emory's Candler School of Theology, spoke last. He said he was "overwhelmed" by the quality of the exhibition. "I am proud to be a part of Emory," he said. Lafayette also recalled being with the Rev. Martin Luther King Jr. on the night and the morning before his assassination. "Martin Luther King was part of a dream . . . he was shot because they were trying to kill that dream," he said. "I have an announcement for the media: They missed."